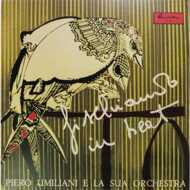 Due to a perhaps too buoyant and unfitting title and to a ridicolously limited distribution (even at the time of its original release), Fischiando in beat (Whistling in beat) has often been ignored despite being one of the most entertaining works signed by Piero Umiliani (here accompanied by his orchestra). Originally released in 1969, Fischiando in beat presents twelve gems of instrumental beat music, fabulous specimen of that music genre often labelled with the much-abused term 'lounge' - or 'easy listening', if you prefer. Forget about the experimental Synthi Time (to name another Umiliani classic recently reissued by Schema Records) and abandon any intellectual ambitions: here you can only breathe an incredible desire for fun and dream of the late 60s, Rome and its exclusive cocktail party. This LP's moods are easier to understand just by reading the track titles: starting with the classic beat of the title-track and Il motivetto delle 10:30 (The 10.30am tune) followed by the brazilian joints Highway to Rio and Samba mah nà (a sort of alternative version of his most known composition, the world famous Mah-nà Mah-nà); the trip goes on with the sicilian flavoured Marranzano boogie and then touches the US with Ti piace New York? (Do you like New York? ), another track that swings just right. It all ends to a tribute to Japan with Tokyo Blues, anticipating the final Go, go, go, almost a jazz standard and perhaps an homage to Umiliani's past, who had cut his teeth with this genre at the beginning of his career (and not only). The only mellow moment comes with Sono nostalgico (I'm nostalgic), a sad and smoky ballad, a tear-inducing moment. B2. Ti Piace New York?